My husband and I got Angel from the local Humane Society when she was 3 months old. She was all white!! She was the best cat ever!! We had her for 13.5 years. Had to put her to sleep in October 2013 because of a cancer growth that wouldn't heal. WE now have our own SPECIAL Angel in heaven!! Aww so sorry to hear about your lose but glad you got to spend time with her and I'm sure she was thankful. Such a beautiful cat. We had an all white cat for a years. It's funny to think about it but the whole time we had him we thought it was a female until the end when my parents took him to the vet and found out that it was a he but all that time we thought it was a female. They had to put 2 cats down and it was hard especially with one that my mom was attached to. His name was Slyvester. He looked just like the cartoon cat except without the red nose, but was really sweet and cute and he was the first gift my dad got her when we first moved up here to Georgia from Florida. Then he got sick and no one could find out what was wrong with him, so they did the best thing they could for him. Then the other one, Snowflake, the one we thought was a female got sick and found out that he had diabetes, which they could have treated the rest of his life, but they knew he was suffering. So it's hard to lose a loved one and even though you think you didn't do the right thing, you know in your heart you did, and they aren't suffering anymore. At least you got the time with him and he got to live a long life with you. How sweet and pretty your Angel was. 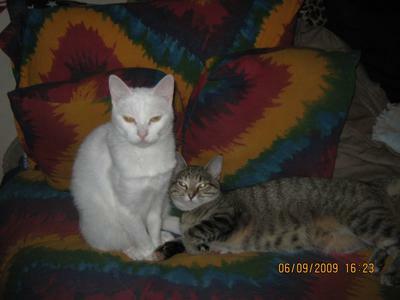 I can sure feel your pain because I lost my George, a white Turkish Angora boy. He adored me and I adored him. I put him to sleep in 2011 from kidney failure, but he was 14 years old and I thank God I had him that long. You will keep Angel in your heart forever, as I do mine. Bless you my dear. So sorry for your loss, but I'll bet Angel thinks you and your husband were the best parents ever! Your pet is at the "Rainbow Bridge"
I'm sorry for your loss, Elaine.